LawToolBox is an online, rule-based deadline calculator that I reviewed in some depth in 2013. Ever since 2013, it has integrated with Microsoft Outlook through an Office 365 app. But the integration was one way, meaning that all calculations and changes had to be made through the LawToolBox website, after which they would be automatically added to an Outlook calendar. Now, LawToolBox is preparing to launch a new, more robust integration called LawToolBox365, which will be an add-in for Outlook 2013 and 2016 that will reside entirely within Office 365. It will be available for purchase in late May. 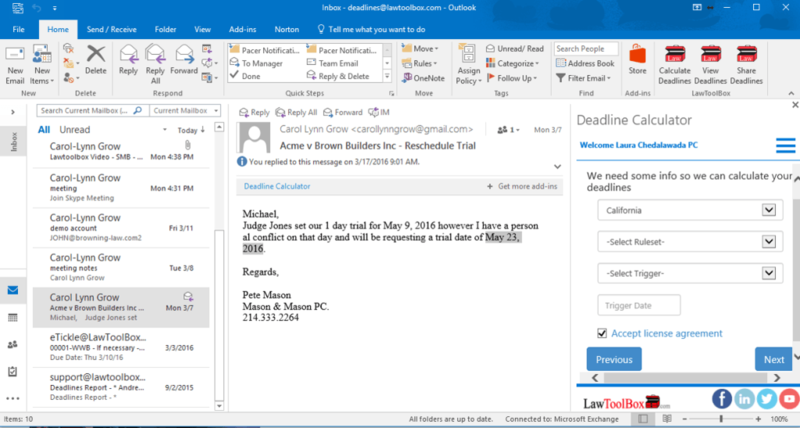 This matter-based court deadline solution inside Outlook will be designed for law firms and legal departments and will work with all small business and enterprise versions of Office 365 that include Outlook online or on premise, ranging from Exchange Online all the way up to Microsoft’s Office 365 Enterprise 5 which includes voice with Cloud PBX. Because LawToolBox deadlines can be added to Outlook or Google calendars, and because most case-management systems also have two-way sync to Outlook or Google calendars, LawToolBox deadlines in Office 365 will work with any case management system using Outlook or Google as a bridge. This post was a LitigationWorld Pick of the Week. At the recent ABA Techshow in Chicago, Carol Lynn Grow, VP sales and marketing at LawToolBox, gave me a preview of LawToolBox365. She told me that as law firms expand their adoption of Office365, LawToolBox is continuing to focus substantial internal resources into aligning its products with Microsoft products. For example, as new features and functions such as “buttons in the ribbon” and “compose mode” are being rolled out inside Outlook 2016, LawToolBox is leveraging these new features when contextually relevant to the calculation and management of deadlines. The new add-in will enable users to calculate, view and share deadlines directly within Outlook. One very cool feature is the ability to calculate deadlines directly from emails, including from PACER emails. If, for example, you receive an email from the court notifying you that a trial date has been set, you can simply highlight the email text, select the appropriate court rule set, and calculate all relevant deadlines, directly from within Outlook. The deadlines can then be added to your Outlook calendar and shared with others via email. In addition to selling LawToolBox365 directly, Grow said that it will also be offered through the Microsoft Partner Channel.